Data Carpentry is a partner of Software Carpentry designed to teach basic concepts, skills and tools for working more effectively with data. Data Carpentry aims to teach researchers to retrieve, view, manipulate, analyze and store their's and other's data in an open and reproducible way. ELIXIR is an official Software and Data Carpentry partner, with a long-term commitment to the growth and spread of Software and Data Carpentry mission. unites Europe’s leading life science organizations in managing and safeguarding the increasing volume of data being generated by publicly funded research. Through a single infrastructure, ELIXIR makes it easier for scientists to find and share data, exchange expertise, and agree on best practices. *** Training eSupport System (TeSS) portal is an example of an ELIXIR resource. TeSS is online training portal that gathers life science training materials and training courses from across Europe, and allows you to search it in one website. ELIXIR supplies a listing of Database Services provided by the ELIXIR Nodes that, based on clear eligibility criteria and best practice in service delivery, are visibly branded and provide the bioinformatics user community with a toolbox of stable and well-maintained services. One of the key ELIXIR's tasks is collaborative development and improvement of training materials, depending on the community needs. These needs are best gauged by the community members (represented by organisations) themselves. 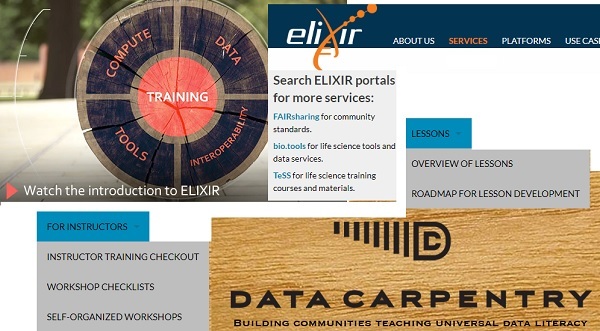 The ELIXIR Data and Software Carpentry Pilot (led by ELIXIR UK) has started in 2015 to leverage the work of the existing international Data Carpentry network in developing training programme for ELIXIR. See Data Carpentry Lessons page with links to all available lessons and information about topics and domains under development. These lessons are distributed under the CC-BY and are free for re-use or adaptation, with attribution. You can be an instructor, help develop content, or support Data Carpentry.